Thank you so much for all of the love on yesterday's blog post. I've said it once and I'll say it again- this community has been a blessing to me and I am so thankful for each and every one of you!! Thank you for allowing me to speak my heart. Today we're going to chat about something pretty fun! It's a question that's been asked a thousand times. Even I ask myself occasionally. 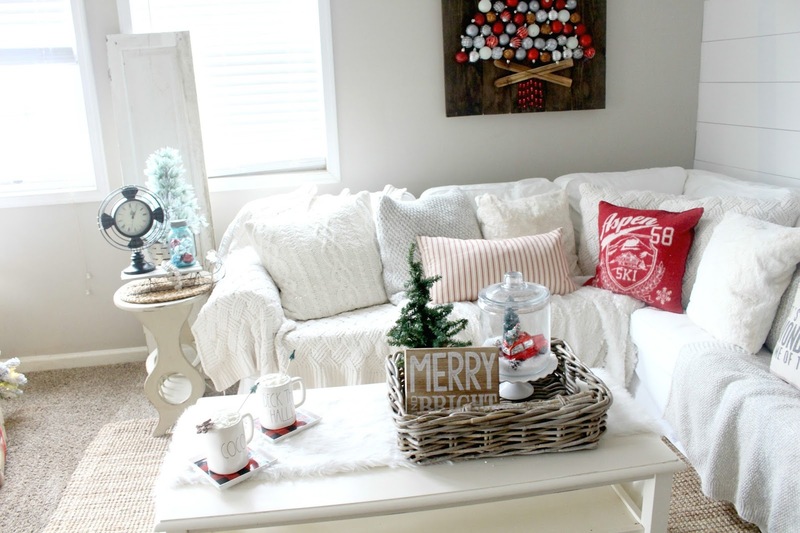 "How do I decorate my coffee table for Christmas? Or in general?" There are some tips and tricks I've discovered over time that have really helped me when decorating my coffee table- for Holidays and beyond. 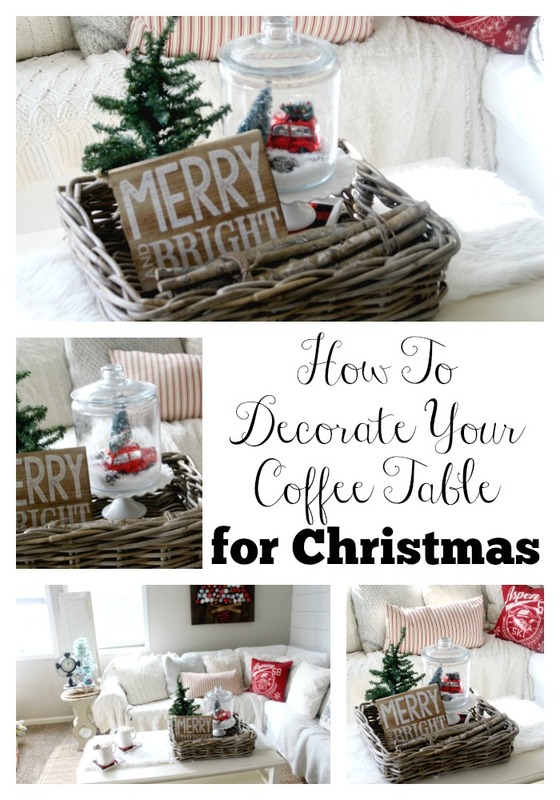 For this post I'll stick to Christmas, but I'll hit on some ways you can decorate your coffee tables beyond the Holiday season too! Honestly, once you learn the basics you'll be decorating your table like a pro every Holiday and season! Promise. I always start with a basket, or tray of some kind. I've also been known to use a dough bowl occasionally. It can be anything you want really, an old crate? A tray? A basket? Anything as long as it gives you a base and place to hold things. Something to add height, Something to add interest, and Some Greenery or something that adds texture. Or both! But one or the other will usually do. Cotton Stems, Lambs ear, Deer Antlers, Corbels, Spindles- just something that is appealing and interesting at the same time that the eye will be drawn to. For this particular display, that's the little glass jar globe. For this display it's the little green tree, but this is also there for texture and interest. You can use lambs ear, dried hydrangeas, fresh evergreen or boxwood to add greenery to your displays. Now that you have your basket and your baskets, you're going to want to put them together in a visually appealing way, it's always good to have something vertical to add more depth, in this display it's the 'Merry and Bright' sign but I've used old books in the past. Honestly, you should typically be able to get a feel of what's working for you and what's not by playing around with different things, but I do like to keep the basics pretty simple. So let's go over this one more time shall we? That's it! Using these four things should get you a pretty vignette every single time. If an item isn't sitting high enough, sit it on a short (or tall!) cake stand! It will give you instant height. Vintage Bottles and Vases are great for adding texture and interest. They are also a good way to add greenery into your displays as you can easily stick a cotton stem in a bottle vase. Adding a Table Runner is a great way to pull everything together and create a layered look. Target Dollar Spot often has great seasonal table runners! If you are curious to know where something was from that you don't see listed above, shoot me a message and I'll try to help you figure out where to find out! Happy Friday my friends! Have a great weekend! So many great tips!! Love it! Love your coffee table all decorated for Christmas, especially the car & snow scene in the jar! Thanks for sharing - love that idea! 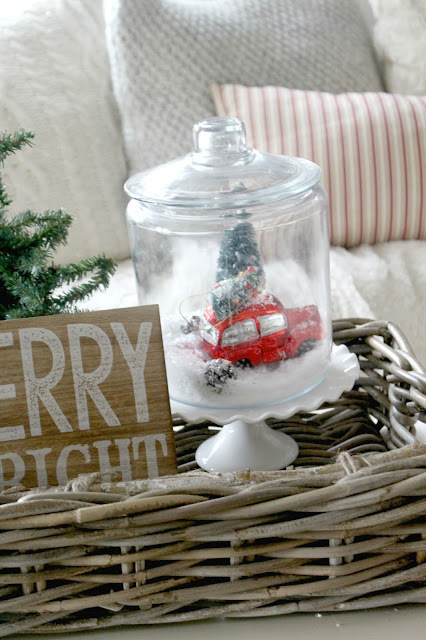 Also love your Christmas ornament project on the wall - every time I see it!! :) Happy Weekend! Do you have a formula like that for a foyer table? I'm always struggling with that. But first I'm going to go style my coffee table in my Mom cave! Thank you for the tips! These are great tips! Your tables always look amazing. Given this widespread popularity, it is no surprise that many people have wondered if drinking coffee is an unhealthy habit.gourmet coffee Caffeine, after all, is a stimulant drug and is addictive.